In previous post (can be found here) we created a simple event handler in Domoticz to control a power plug based on the events from a motion sensor. In this post we will step it up a notch and build a basic alarm system. If you are not familiar with the Events interface in Domoticz, we recommend you go through our previous post first. Let the siren time-out after 3 minutes. The alarm system will still be in ”armed” mode. If the burglar has not been scarred after 3 minutes, the siren will most likely only annoy your neighbours. We will be using the Z-Wave Power Plug to switch on a lamp instead of a siren, since it’s more friendly for our ears while developing. Once you’re done, it’s simple to exchange the power plug for a Z-Wave siren. Person arming the system on the security panel: the system will jump to ”Armed”. Person disarming the system on the security panel: the system will jump to ”Disarmed” regardless of previous state, the siren will be turned off. The siren has sounded for 3 minutes: the system will jump to ”Armed” and the siren will be turned off. The system is ready to detect new motion. I know it looks a bit cluttered but it will be a big help when building the event handling. 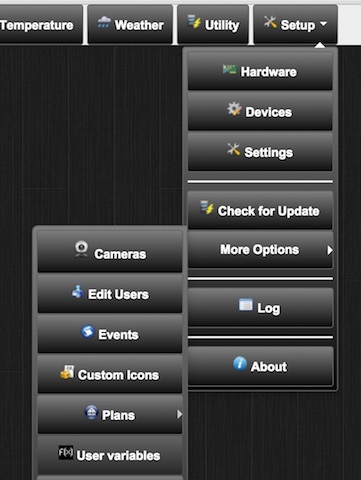 Go to the Domoticz ”Setup” drop-down menu and select ”More Options” -> ”User variables”. Then enter the name ”Alarm State” and the variable value ”1”, and click ”Add”. Go to the ”Setup” menu and select ”Hardware”. This view should be familiar to you by now. Enter the name ”Sound Siren” and select ”Dummy” in the ”Type” drop-down list. Click ”Add”. The dummy hardware appears in the list where your Raspberry is. Next, click on ”Create Virtual Sensors”. 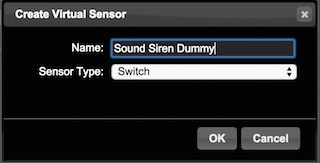 Enter the name ”Sound Siren Dummy” and select ”Switch” in the ”Sensor Type” drop-down list. Click ”OK”. We will use this dummy switch to decide if we should start the siren. The condition is that we are in alarm state ”Motion Triggered” and that the delay time of 45 seconds has passed. Now, on to building the events handling. Select ”More Options” -> ”Events” from the ”Setup” menu. You can check the previous post if you’re not familiar with how the Events interface works (here). To arm our alarm system, we build the following event handler. This will move the alarm system from state 1 (Disarmed) to state 2 (Armed). You find the ”Alarm State” variable in the category ”User variables” in the left side menu. The ”Security status” switch is found in the ”Security” category and is directly controlled by the Domoticz security panel that we will use later on. 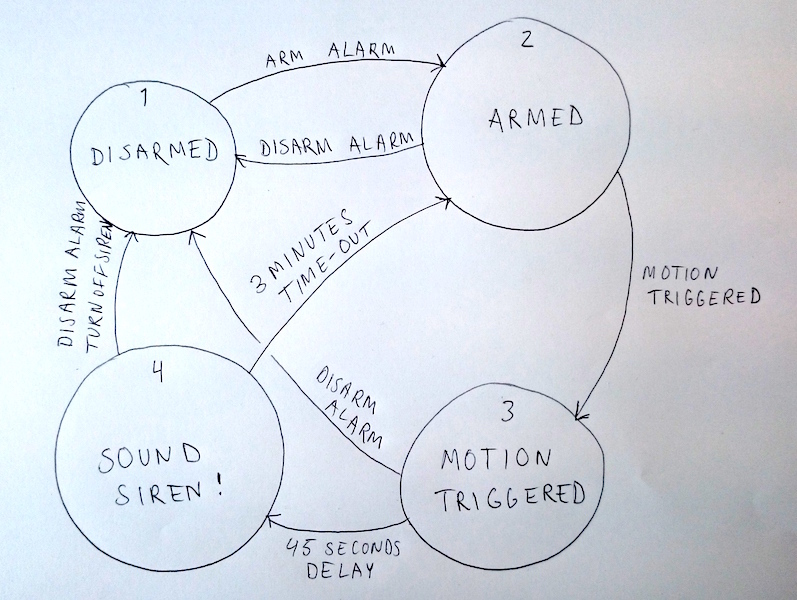 We save the event with the name ”Arm alarm”. Don’t forget to tick the check box ”Event active”. 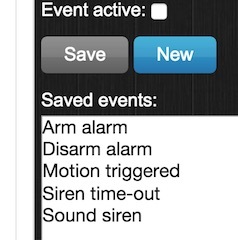 Next we create an event handler for disarming the alarm system. This event handler puts the alarm system in state 1 (Disarmed) regardless of previous state. We also sets our Z-Wave power plug to ”Off” since this represents our siren and we want the siren to be turned off once a valid pin code is entered on the security panel. Most often the siren is not on when someone enters the pin code since the most common use case is that you enter the pin code as soon as you open the door. In this case you have 45 seconds to disarm the alarm system before the siren goes off. We also make sure the dummy switch ”Sound Siren Dummy” is set to ”Off”. We save this event handler with the name ”Disarm alarm”. Next we will create the event handler for state 2 (Armed). This event handler captures the event of the motion sensor, puts the alarm system in state 3 (Motion Triggered), and starts a timer to sound the siren after 45 seconds. This time allows the owner of the house to disarm the alarm system without the siren going off. Save it as ”Motion triggered”. We’re almost done, we now make the event handler for jumping from state 3 to state 4 (Sound siren!). If we get the event of ”Sound Siren Dummy” after the 45 seconds time delay in state 3, we should sound the siren. We also sets a 3 minute (180 seconds) time-out on the siren. Save this as ”Sound siren”. Finally we need to create an event handler for state 4 (Sound siren!). 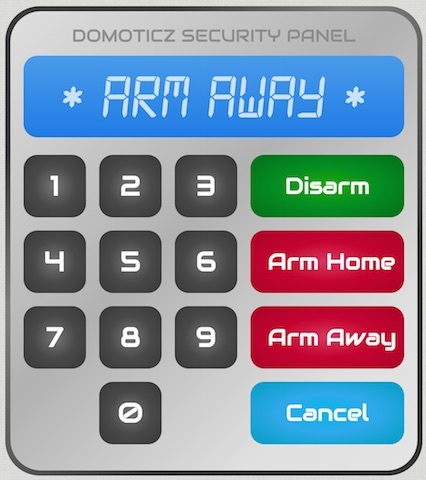 Next we go on to using the security panel of Domoticz. If you go to the ”Setup” menu and select ”More Options” -> ”Security Panel”, you see this view. With this panel, you can arm and disarm the alarm system with just built. You can select the pin code in the ”Setup” menu under ”Settings”. Here you can also set a delay time in order for you to have time to exit your house before the alarm system is armed. Once you have tested the alarm system to make sure it works ok, you can replace the Z-Wave power plug with a Z-Wave siren. Just want to thank you. I used this information and it worked. If i only could let the alarm beep once when arming and beep twice when disarming. This will be a great help for bulding my own alarm system. Daniel, thank you for your good and easy explanation. I have a device and created an event and saved it. However, what I am missing is what and when the event gets triggered? I have created this thing but how does it get fired? Hi Greg! It was honestly a while since I fiddled with Domoticz (it was great fun). I believe if you have a device, let’s say a light switch, then the Z-Wave controller (i.e. Domoticz) automatically monitors events fired. Start with a simple device just to make sure you get it working in Domoticz. Not sure if you’ve checked out the previous post: http://www.yellington.com/using-events-in-domoticz/ ?